Jingle Smells! Fantastic Festive Fragrances from Pure Essential Oils. - Amphora Aromatics Ltd – Supplier of pure essential oils and aromatherapy Products. Jingle Smells! Fantastic Festive Fragrances from Pure Essential Oils. With Christmas drawing ever closer we thought we’d highlight some of our most well-loved aromas for the festive season. the occasional drink or two (!) and beautiful decorations. Add some delicious spicy scents and you’ve got the perfect mix. Over the next few days we'll give you some ideas for recipes and blends to make your home or office smell wonderfully welcoming! We’ll highlight some of the traditional aromas associated with winter festivities. Using pure essential oils rather than synthetically fragranced products means you can fill your home with a beautifully pure aroma that is free from chemicals and has added therapeutic properties to benefit you and your loved ones. 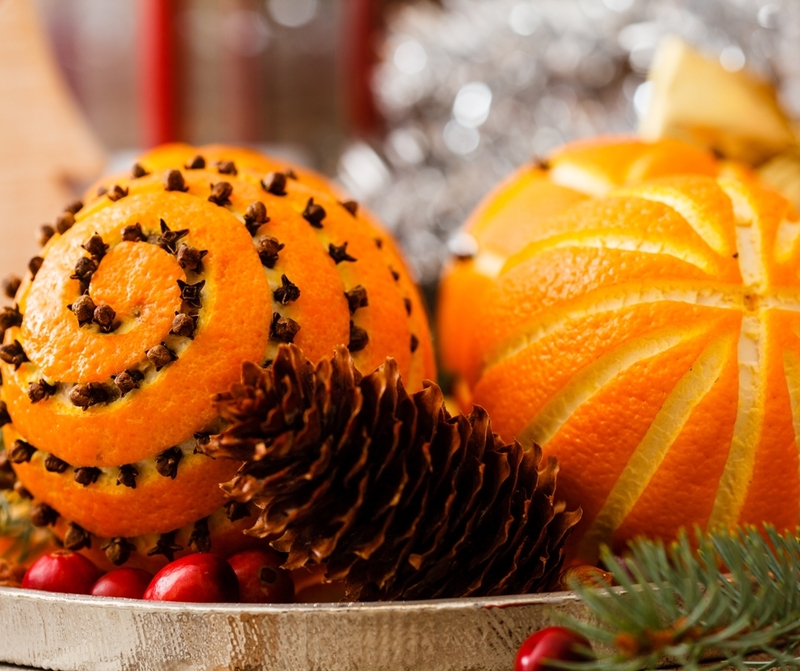 Oranges have a long tradition as a stocking filler. They are rooted in the Christmas tradition from the story of St. Nicholas. He inherited a fortune and used it to help the poor and underprivileged. St. Nicholas was thought to have come across one poor man in particular who had three daughters. As the story goes, St. Nicholas tossed three bags of gold down the chimney for the three daughters to enable them to marry. These bags turned into balls of gold which overtime became symbolized as oranges. Oranges are also used during the Christingle ceremony celebrated by Christians each year. Oranges are decorated with a candle, ribbon and cocktail sticks containing fruit or sweets. The orange represents the earth, the candle symbolizes the light of Christ and the four sticks of fruit represent the Earth’s seasons. Oranges studded with cloves to create a Pomander became popular in the 18th century. They were given as gifts amongst the noble classes of the day and are still a popular decoration in many homes across the world due to the visual attractiveness and the lovely sweet and spicy aroma they provide. Sweet orange essential oil is a well-loved scent which can help to brighten and uplift the senses and mind. It can even help to reduce stress levels (as much as Christmas is an enjoyable time, there can be elements of stress in all the preparation and organisation!). Thank you for reading. Don’t forget to check our blog over the next few days for more enticing Jingle Smells!